Some hints and moments of Zoro x Nami from Color Spreads. 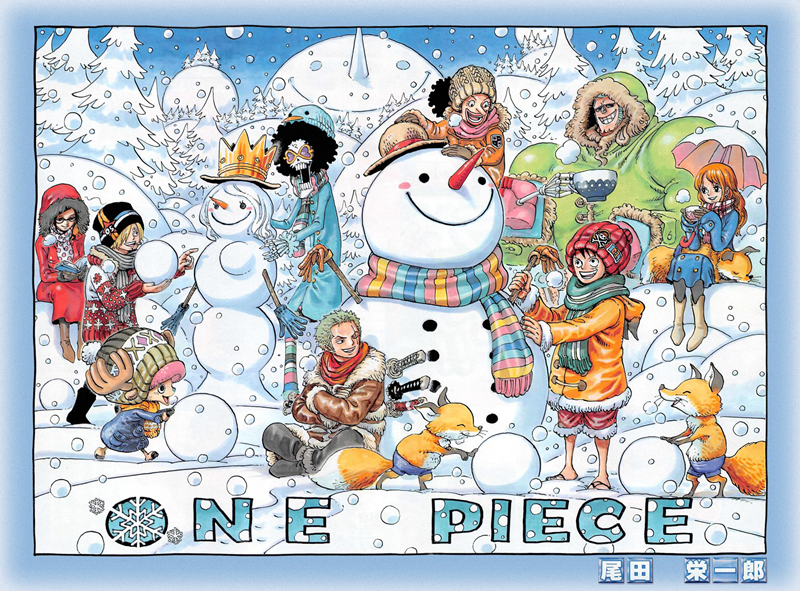 In this pic it seems like Zoro is looking in Nami's direction. Zoro is sitting on a panther with scars located on a left shoulder... exactly the place where Nami stabbed herself with a knife (and where she has a scar that her new tattoo hides). Another interesting thing is that both Zoro and Nami have a similar accessory on their left hands. 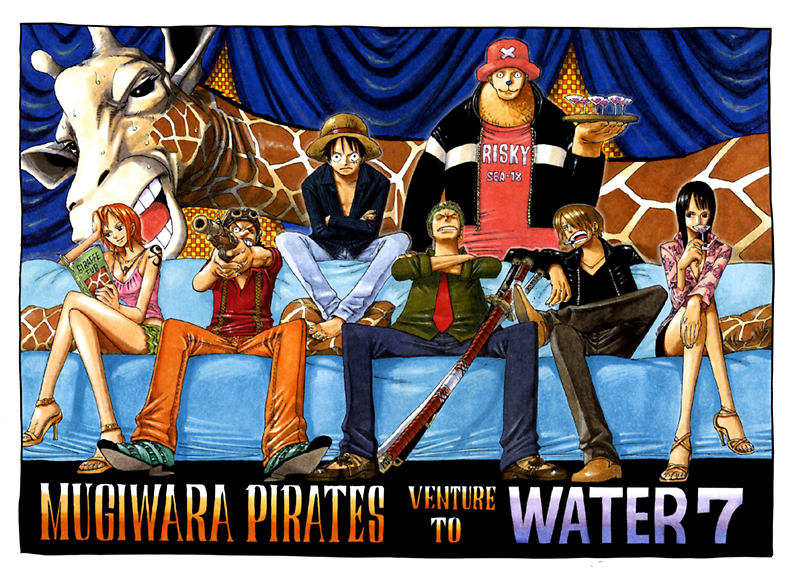 Nami and Zoro are both sitting on the same giant. 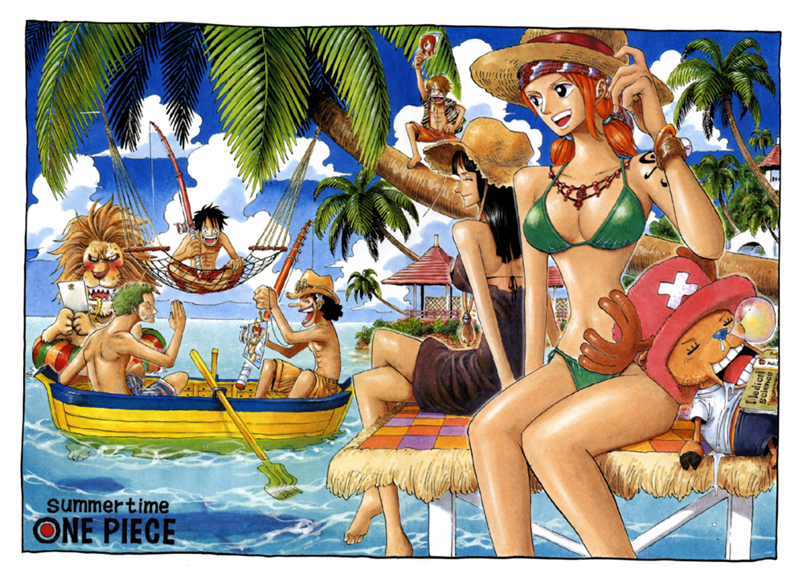 It's almost like Zoro is saying to Nami something like "Hey, look!" and Nami "What are you talking about?" 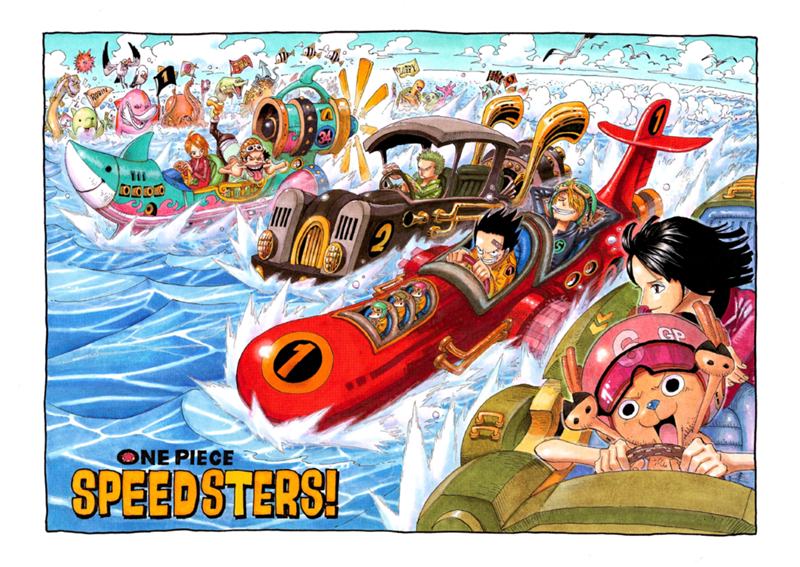 Chopper's color is pink, Nami's is orange and Zoro's is green, and here, we have three crocodiles with such colors! It almost seems like a crocodile family -> family Zoro, Nami and Chopper Oda drew there ^^ not to mention that the crocodiles pretty much resemble each of them ^^ the pink crocodile (Chopper) is the cutest of them, the orange crocodile (Nami) is in a fight with Zoro (pretty much like how Zoro and Nami argue and Zoro sometimes finds her a bit annoying) and the last green crocodile (Zoro) is a bit grumpy when Nami's t-shirt is being washed by it - similarly like how Nami can rub Zoro the way he is annoyed yet at the same time he has to do what she wants ^^"
I have read in Color Walk that Oda said he wanted to draw a giraffe (standing), but that would take a lot of space, so he drew it horizontally. 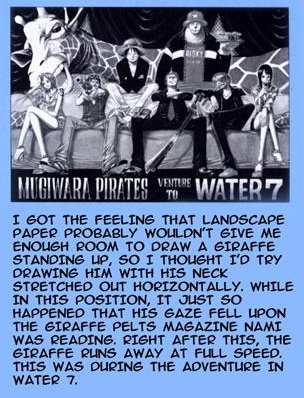 And somehow while drawing that giraffe, it happened to be looking in Nami's book ^^" well, there is also a possibility that he was inspired by his own colorspread and granted Kaku the super-giraffe look ^^"
If you look closely, you can see that the boys are trying to use Nami's photos as a bait and Zoro is making a don't-do-it face. 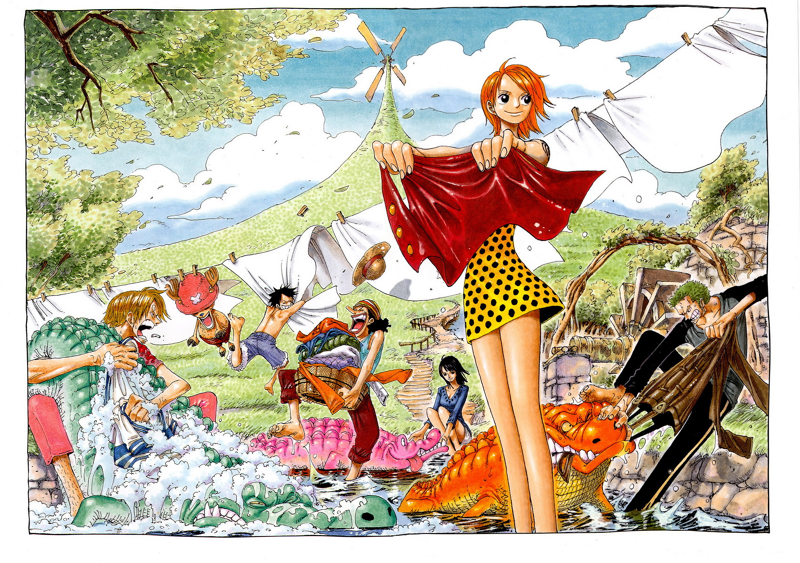 Nami is looking in their direction and she seems to be happy about Zoro's reaction. Nami didn't seem to really mind, but the fact Zoro was opposed to it can also mean he himself doesn't really fancy the idea of fishes being baited on the photos of her - I think this is an absolutely awesome hint that he doesn't want Nami's photos to be used in such a way and I find that to be endearing ^^ there were only Nami's photos after all! 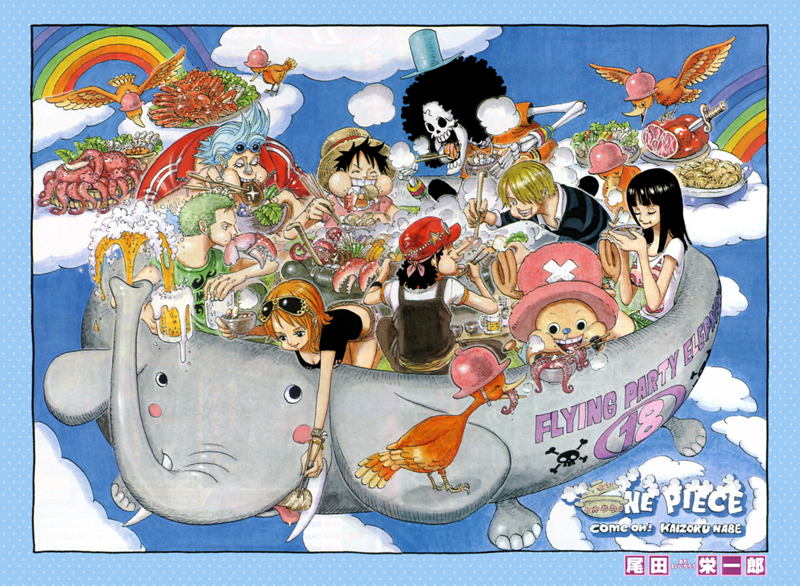 What's more, Nami is sitting in a shark-shaped vehicle - and shark represents Zoro ^^ uh no, this isn't implying a ship with Usopp, because the one who is driving the vehicle isn't him, but Nami (please refrain from having some perverted ideas). 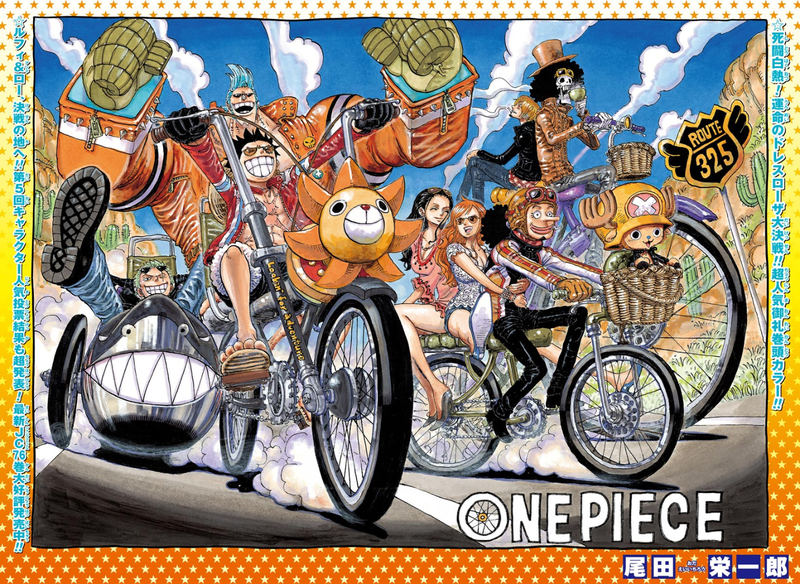 Btw is it just me or does Usopp often appear with them...? 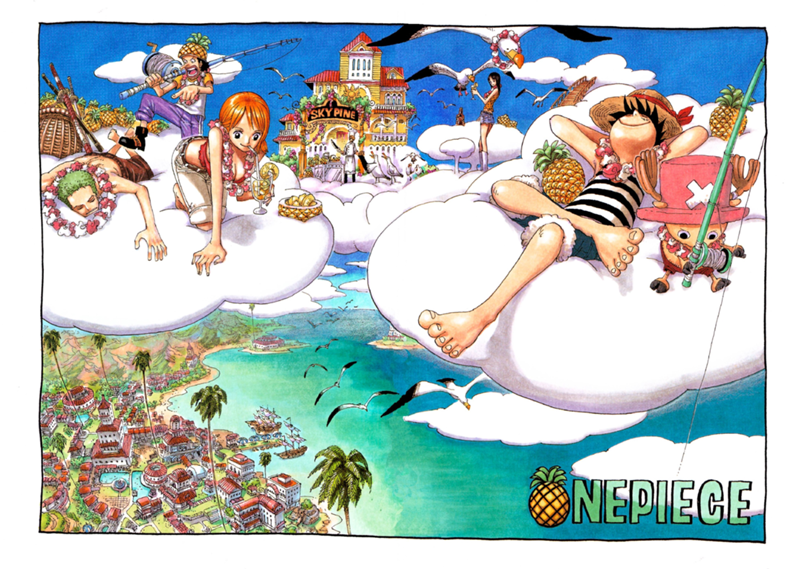 Now looking at this color spread, I am having a lot of ZoNa vibe. 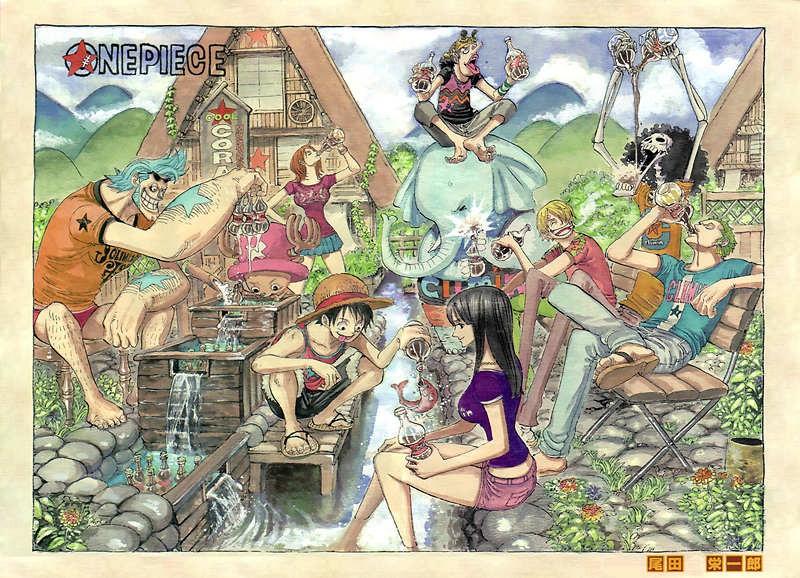 First of, there isn't SANJI. 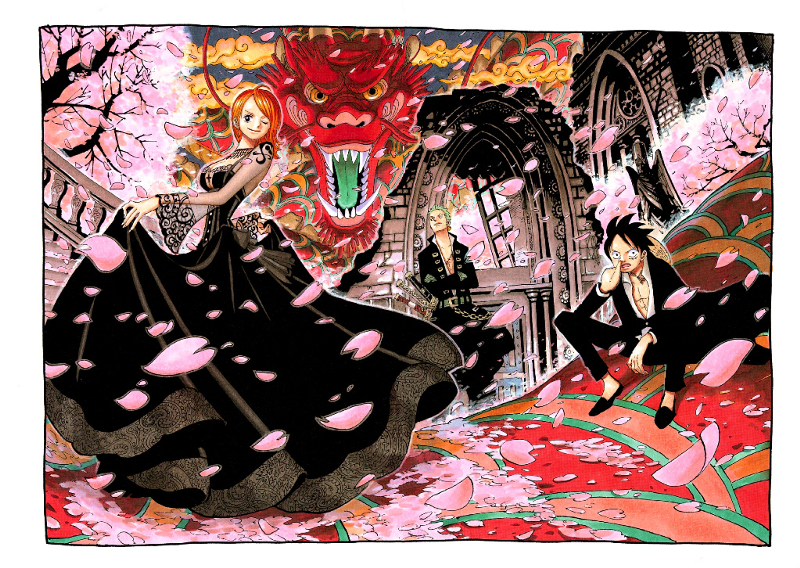 Second, I can't get off my thought that Oda just wanted Zoro and Nami in this pic, but considering how many people out there love LuNa, they would not be very happy about it and he had to add the clearly uninterested Luffy there... but this is just my thought xD Oda described this pic somehow along the lines "Sakura storm whirling in the night breeze. It's a nightime sakura dance party tonight! Being a little nostalgic? ... wait! he's picking his nose!" Ok, to be honest about this one, I was at first just happy that Zoro, Nami and Luffy are here together (especially Zoro and Nami :P). I just left it like that. 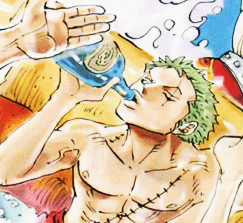 A lot later I went to a fandom and someone pointed out something I couldn't have known, because I was not really into such stuff... but apparently after reading that person's statement I can't help but think Oda is giving us the greatest Zoro x Nami hint that could possibly exist. 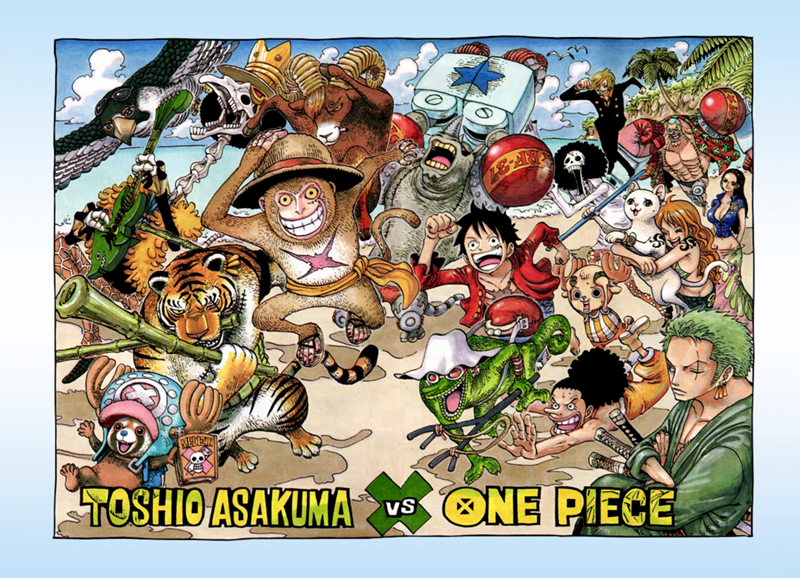 We can see Luffy standing in the middle of a picture and he has a leg on the tiger and a hand wrapped around the dragon. This way, it seems like he is trying to bring the tiger and dragon together. Now, we see Nami and behind her is the said tiger. Then, there is Zoro and behind him is the dragon. In the yin yang perspective, tiger and women represent yin, while dragon and men represent yang. I think even if you didn't know all this, you should at least know what yin yang is about - yin and yang represent the opposite of each other, which just means that Nami is the opposite of Zoro and vice versa. 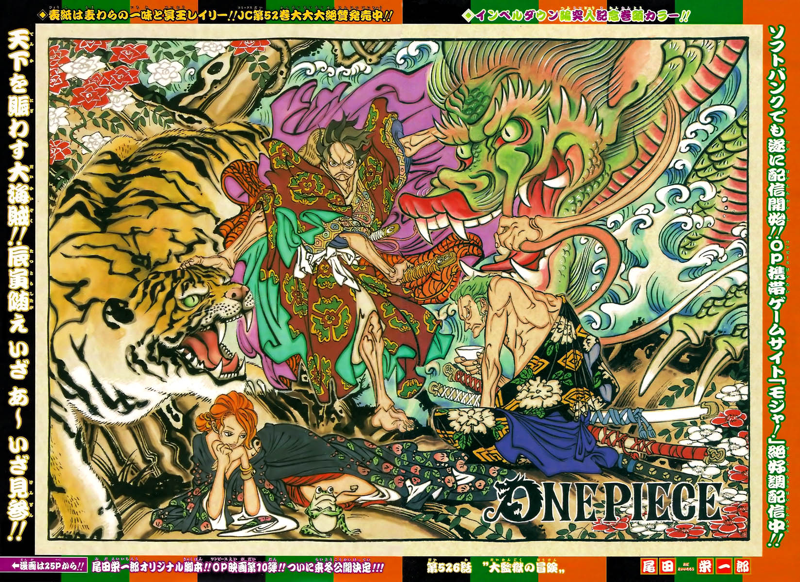 The dragon which represents Zoro came from the sea and waves are surrounding him. And guesss what? Waves are the meaning of Nami's name! NEW: Also... this might be stretching it a bit, but after LiiNaruChan send me a picture of flowers of citrus plants, I am starting to really think the pattern on Zoro's clothes represent mikans (tangerines).... because the flowers are white, which are the same colour as those on Zoro's clothes. 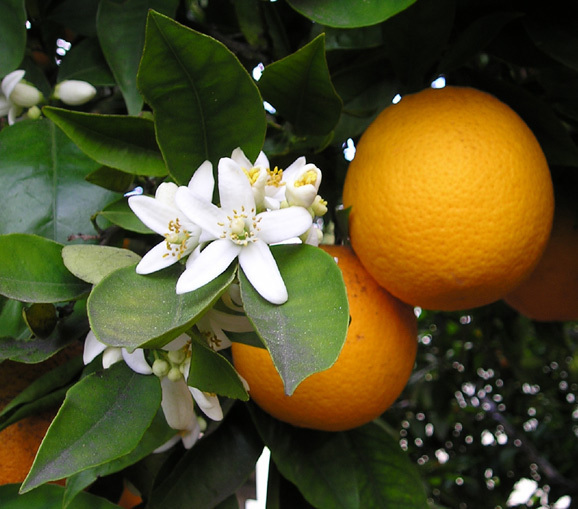 I know this is a picture of an orange, but tangerines also have white flowers. 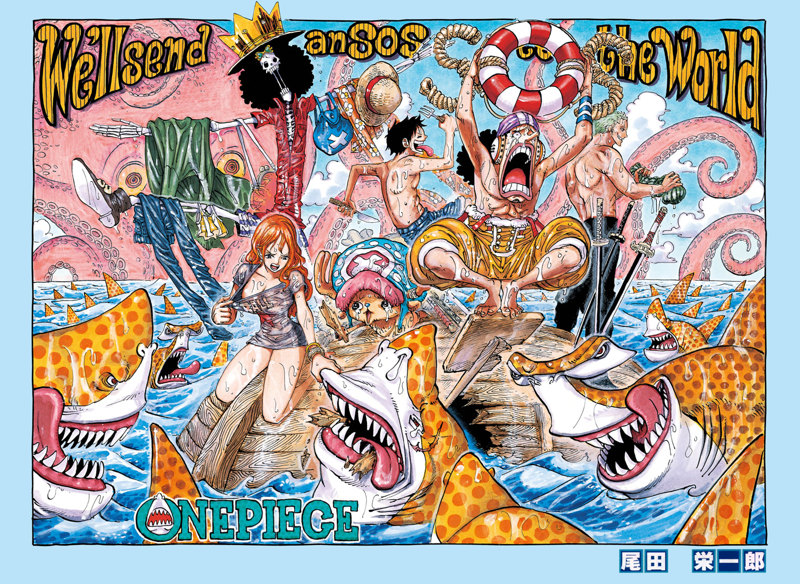 Nami is holding a shark's mouth (and a shark represents Zoro), who has a scar near its left eye (and Zoro has a scar on his left eye). 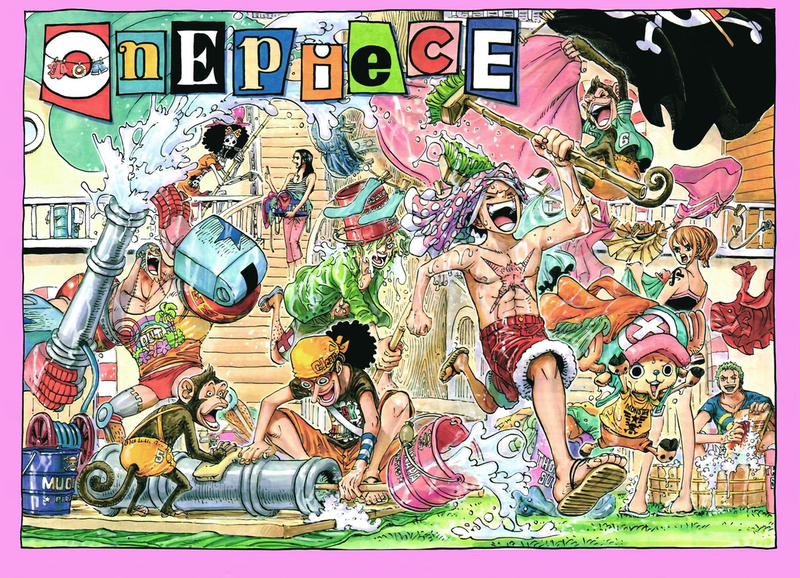 What is interesting about this is the fact although all of them are surrounded by sharks, it is Nami who interacts with one of them the most here (let's just ignore for a minute the fact Luffy is preparing to eat one). 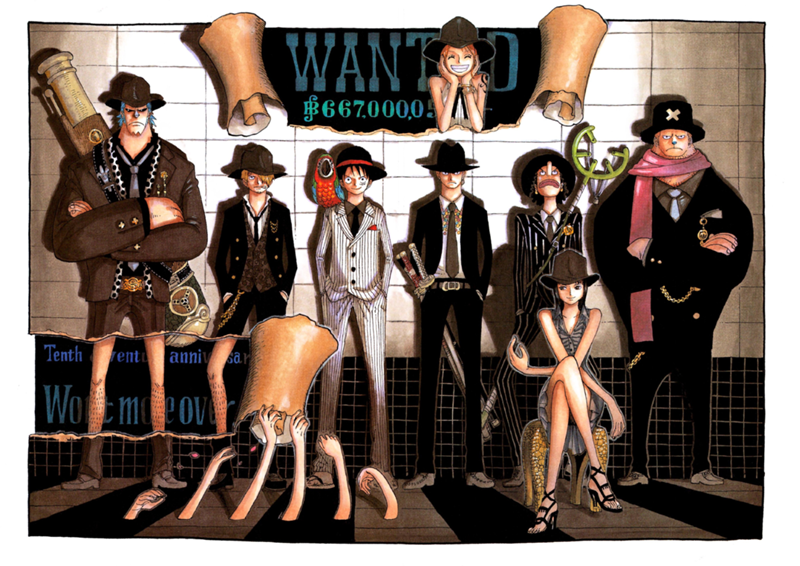 Zoro, Nami and Chopper have their clothes hanging on Brook in the same direction. Here, Zoro stands veery close to Nami and it seems like he is somehow protecting her from the waves - or at least he seems to be concerned about the waves Chopper created. 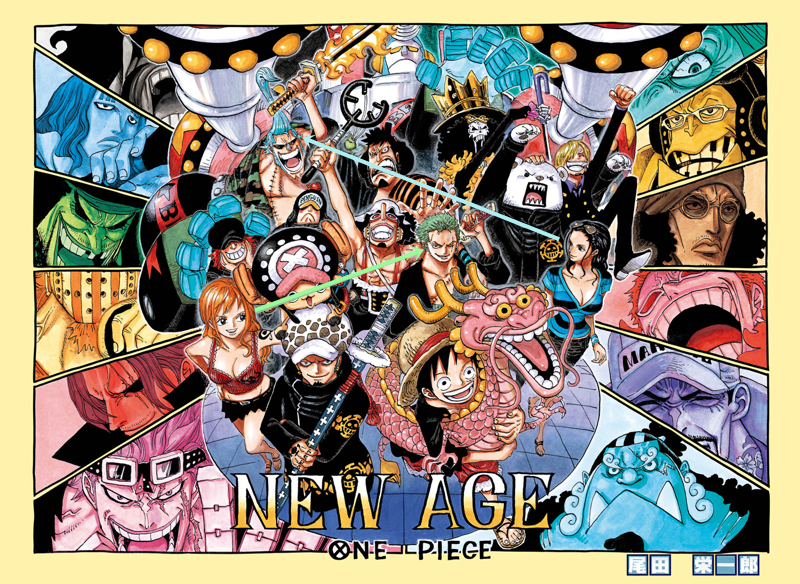 Either way, I really like how close they are and how Zoro also looks like to be protecting her of some sort ^^ Maybe it's just a coincidence, but it also looks like Nami is sitting on his sword ^^"
*dies* *recovers* *dies again* *resurrects* *starts screaming* Ok, maybe I should just calm down xD (how can I??) This colorpsread must be one of the most favourite ones for ZoNa fans out there ^^ and I shall give some detailed analysis of this. First of all, Zoro and Nami act soo much like Luffy’s guardians here (if not parents xD) - their hands are both trying to reach their captain, probably in an attempt to stop him. And hey, look at their faces, they are the only ones who are this worried about Luffy here! 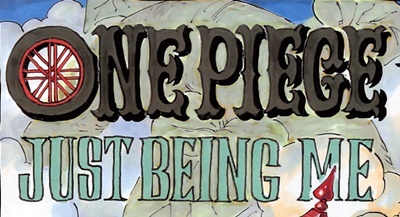 Ho~we~ver, the thing that caught the attention the most must have been the whole Zoro x Nami moment here. 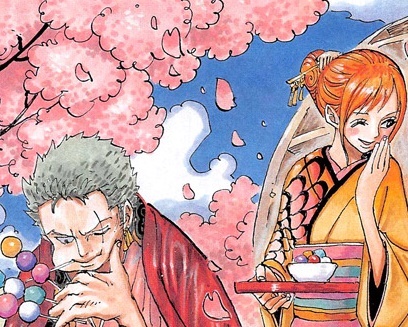 Have we ever seen Zoro and Nami THIS close in colorspreads before? 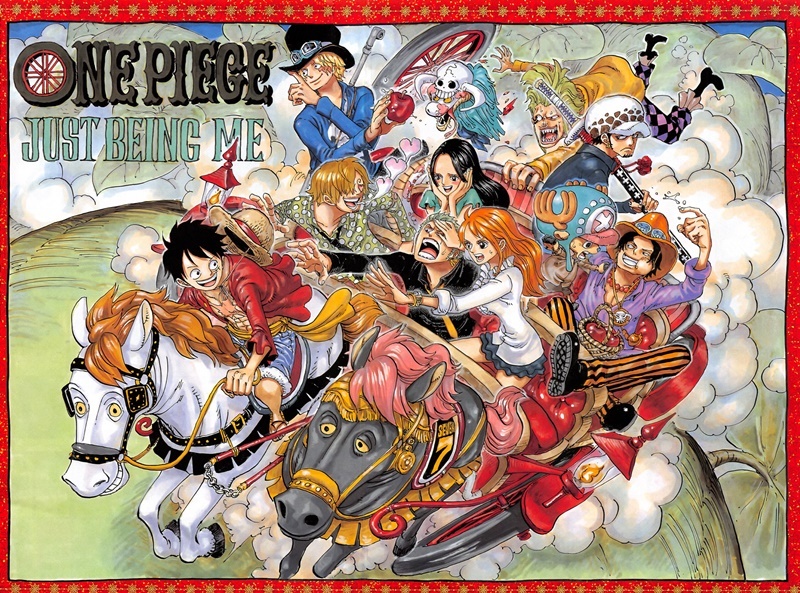 Not just sitting next to each other (and may I say, Nami isn’t sitting next to Sanji, nope, not even a bit, but rather next and only next to Zoro) and Nami even has her hand on Zoro’s face! Maybe she tried to stop him from doing something stupid, or maybe she was trying to steady herself (they were riding a cart that doesn’t seem to be really… erm.. safe) and thus she put her hand on his face? Either way, it’s still special because there weren’t ZoNa interactions as of lately. And heck do I love it.If Nami was trying to stop Zoro from doing something stupid, maybe she should have shoved him and put her hands on his chest (but I bet, many fans would still go crazy about that xD) and if she tried to steady herself, then the fact her hand landed on his face could have been an accident then … yep, it was pretty much an accident, a VERY NICE accident indeed =.= NOT to even mention that the whole hand-on-face moment is almost in the middle of the color spread! 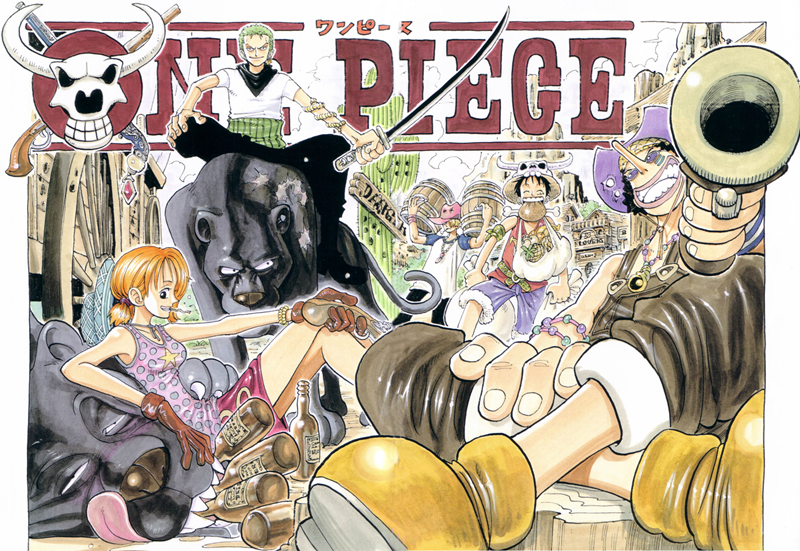 This isn't all though as I have later also realized something very nice - and that's the fact Zoro's other hand that isn't reaching to Luffy is kind of behind Nami =^.^= aah how can such a simple thing as this make me so darn happy. 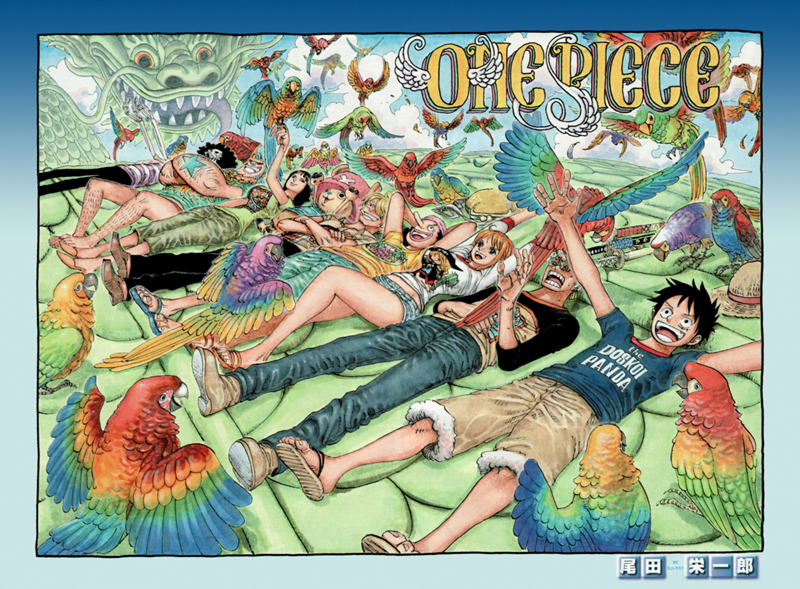 The last thing I can say..well, probably "A perfect title for the best colorspread this year." (PS: I made that tumblr post about this color spread and there are more images describing this moment: ->here<-). Heeey! It has been so frigging long! And My vocabulary got ...erm...you know... more indecent. Hahahah... yeah. Anyway, here goes something new I forgot to add (because my memory is so damn perfect ...yeah)! 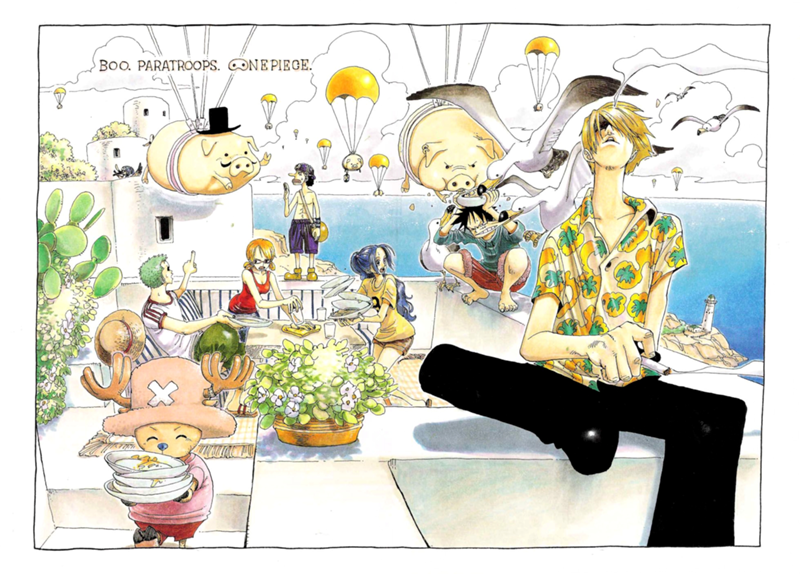 There are two things about this whole chapter, not a color spread alone. 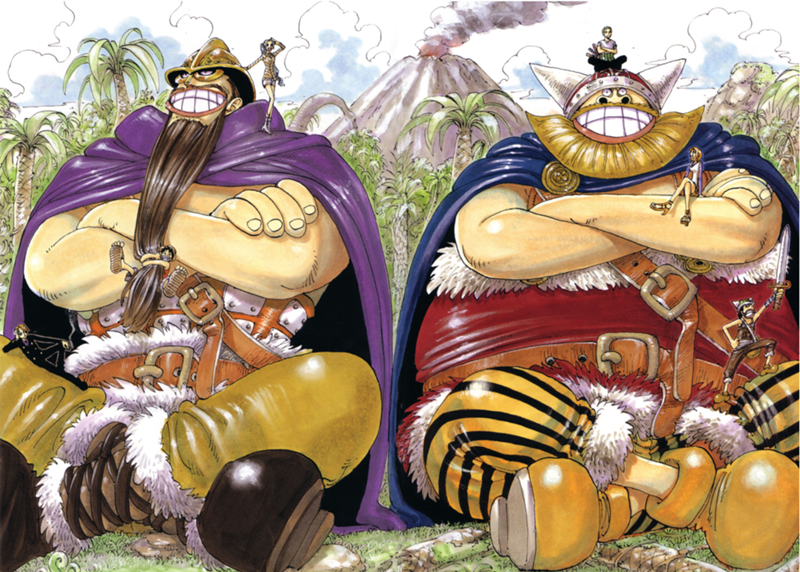 Regarding the color spread, now then please hear me out. We have a crew sitting and driving on something, right? 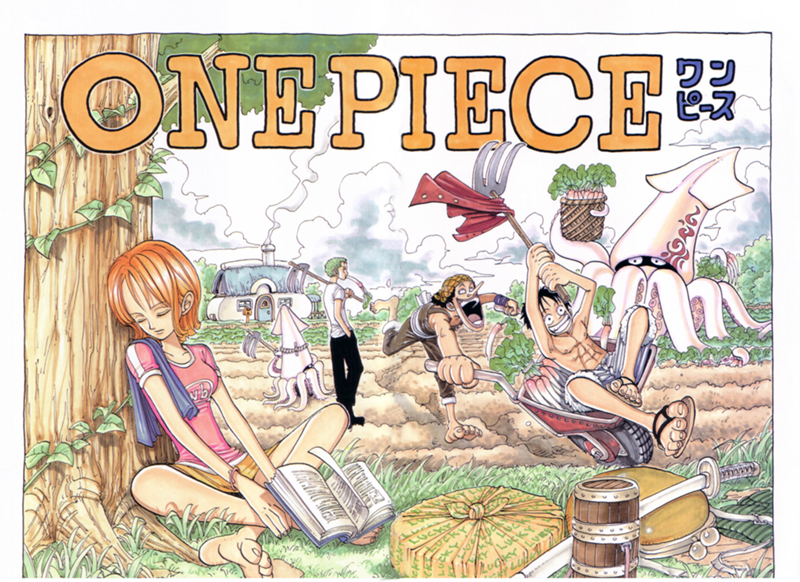 Out of all the crewmembers, Nami and Zoro are the only ones with a rather similar leg pose-both their legs are spreading out. If there is something I really miss, it's definitely ZoNami interactions! 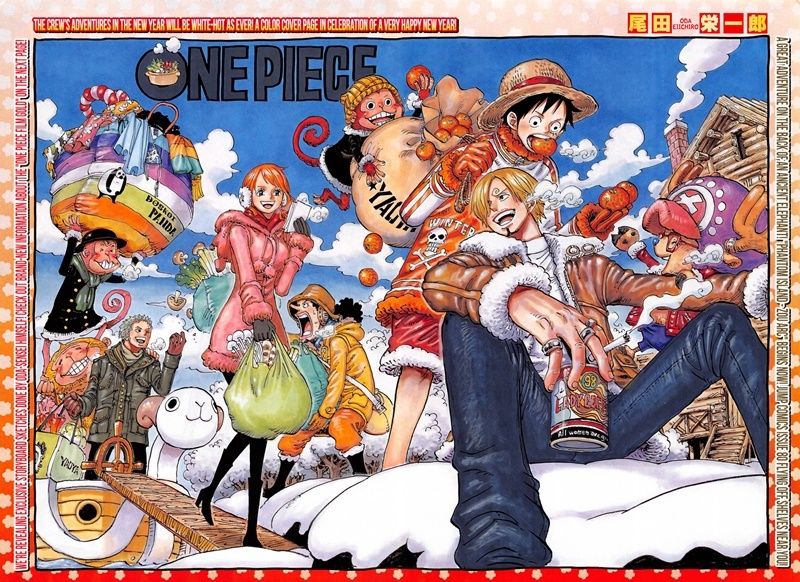 It has also been a long time before we saw Nami again what in the world is Oda thinking? That aside...I am at least glad there is something that I think could be a hint from him... Nami here has a belt with some things that are very similar to Zoro's earrings he has in his left ear, with three stripes and golden colour. 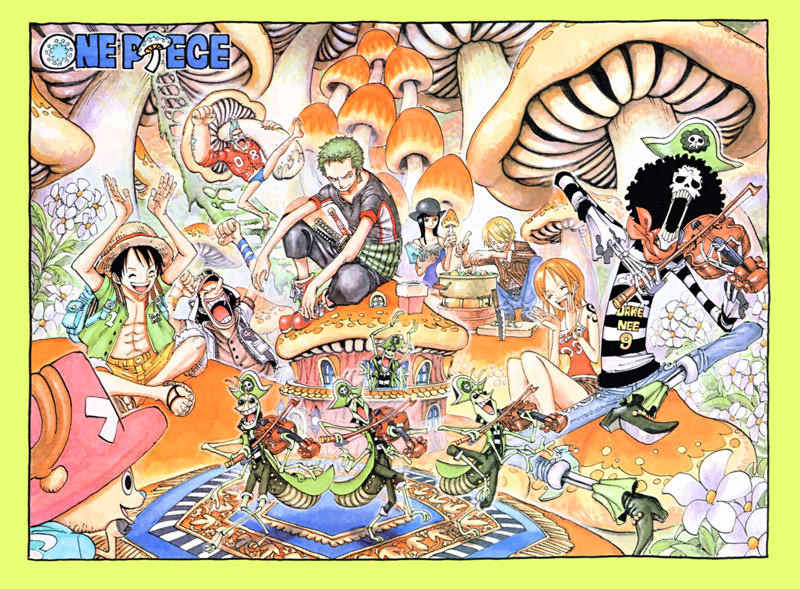 However, looking at this color spread, Zoro doesn't have his earrings here at all. Two things and both about the earrings and things very similar to them, and all in one Color Spread? 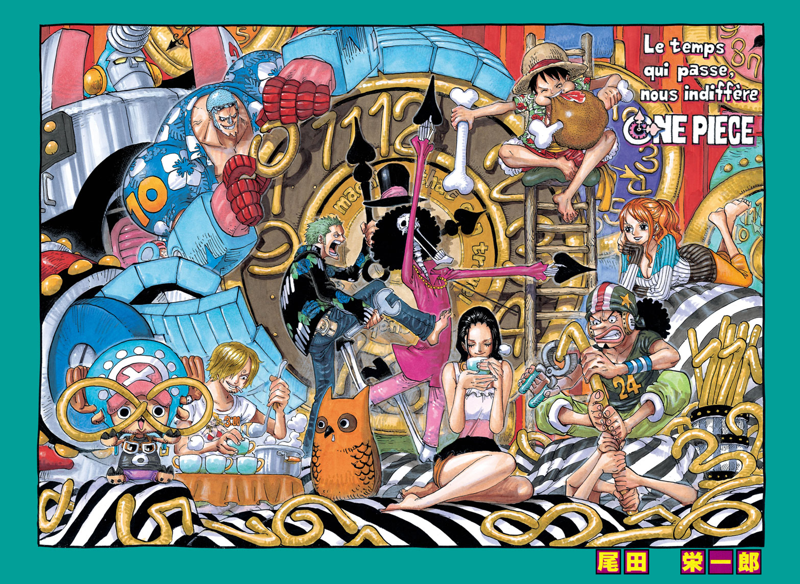 You can call me delusional but I don't think this was just a silly mistake Oda would do. 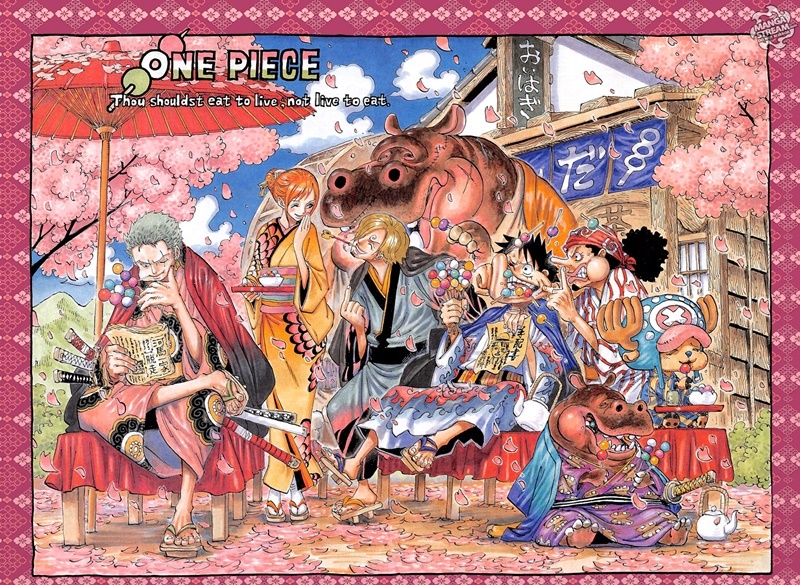 A very beautiful color spread, with a lot of pink, sakura trees. The only thing I miss here are the oldest three members. That aside. While many can argue this spread has a SanNami moment, there are also some small ZoNa hints/moments for appreciation. 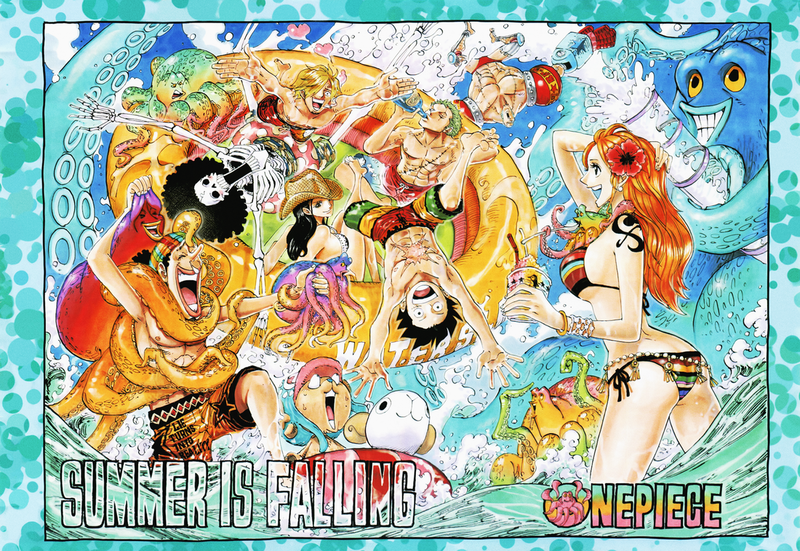 Considering all the possible places to sit and the fact Nami would in no way sit on the floor, then the only one place she can sit is right behind Zoro, under an umbrella... which leads us to another small hints. And lastly, an accessory-related hint. This time, the similarity between them can be compared on the same picture - Zoro's earrings and Nami's hair pin are very, very similar. 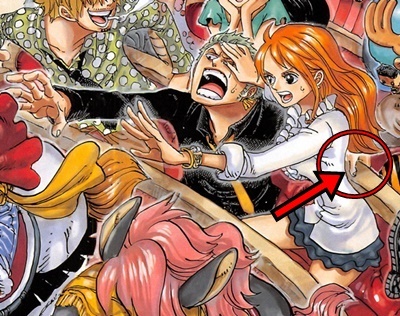 With this, it makes Nami a girl who has worn accessories very similar to Zoro's earrings for at least 3 times now.